Place in a blender 2 bunches of basil. Pulse until smooth consistency. Thinly slice 4 tomatoes, finely slice 1/2 onion into crescent shapes. Thinly slice the black olives into circles. To assemble place 12 flaxseed crackers on a platter. 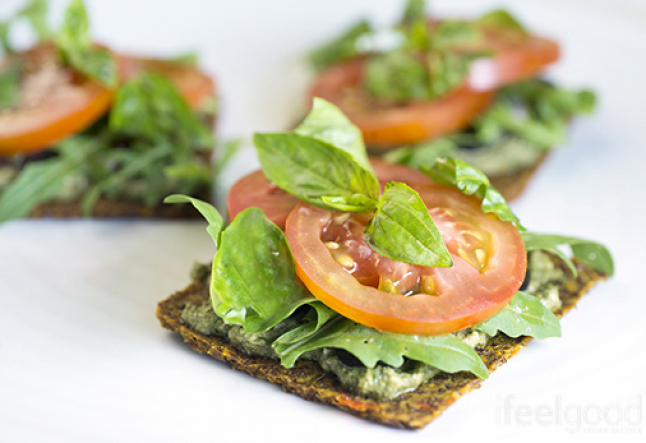 Spread over some pesto to cover the cracker. Place 4 pieces of sliced onion on top of the pesto. Place 8 black olive slices on top of the onion. Top with 4 or 5 arugula leaves. Place 2 slice of tomato on top of the arugula. Sprinkle some ripped basil leaves on top. Sprinkle with a little pinch of salt. Sprinkle with a couple of drops of olive oil. Serve.